In what is being seen as a challenge to US President Donald Trump, Iran tested a 4,000 kilometer range (2,500 miles) ballistic missile capable of carrying a nuclear warhead, US officials said Monday. Terming the test a “flagrant breach” of UN Security Council resolutions, Israel’s Prime Minister Benjamin Netanyahu promptly demanded the reimposition of sanctions against Iran and said he would discuss with Trump a reevaluation of the “entire failed nuclear accord” that the Obama Administration and other P5+1 countries agreed with Iran in 2015. Fox said the missile was launched from Semnan, outside Tehran, and that the failure involved “a reentry vehicle.” It noted that Iran’s Defense Minister Brigadier Gen. Hossein Dehqhan said four months ago that Iran would start producing the missile. Channel 10 said the Khorramshahr is a Russian-developed missile originally intended for submarine launch that is capable of carrying a nuclear warhead. It said North Korea has successfully tested it from a ground launch. Netanyahu, who is set to meet Trump at the White House early next month, said he would urge a resumption of sanctions against Iran for missile testing, and “additional sanctions against [Iranian] terrorism.” He would also discuss with Trump the “handling of this whole failed nuclear accord.” The nuclear deal, intended to thwart Iran’s rogue nuclear program and championed by President Barack Obama as a “game-changer,” has been consistently castigated by Netanyahu as “a bad deal” that actually paves the way for an Iranian nuclear arsenal. Asked about the missile test, White House press secretary Sean Spicer said they were looking into the report. “We’re aware that Iran fired that missile. We’re looking into the exact nature of it,” Spicer said. 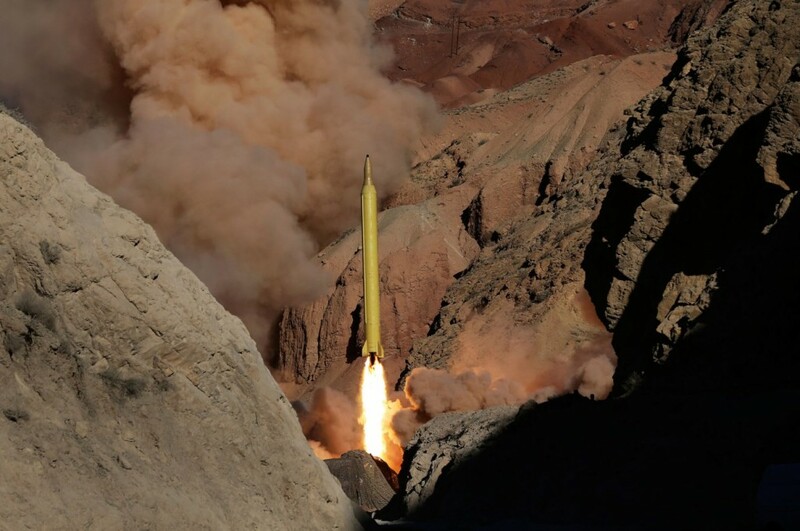 Iran argues that because the nuke deal forbids them from pursuing a nuclear weapon, no ballistic missile is capable of carrying atomic arms that don’t exist and thus tests of them are not out of bounds. News of the test came a day after Trump committed to enforcing the Iranian nuclear deal, despite his campaign pledge to dismantle the landmark accord that he has repeatedly called “disastrous” and “one of the dumbest deals” he’s ever seen. In a Sunday phone call with Saudi Arabia’s King Salman bin Abd Al-Aziz Al Saud, the president pledged to “rigorously enforc[e] the Joint Comprehensive Plan of Action,” referring to the deal’s formal name, according to a White House readout of the conversation.